Yesterday - on the first part of this article - we talked about the nature of pH, the origin of pH changes in hydroponics growing and why these changes happen with time within a hydroponic culture, I also talked a little bit about how to prevent pH changes by building a balanced solution with a given percentage of nitrogen given as ammonium. On the second part of this article I am going to talk about the adaptation of plants against pH changes, why certain pH levels are needed and why there is an important over-focus on the importance of pH which does not need to be maintained in ranges as narrow as most growers believe. What is the ideal range of pH for plant growth ? The fact is that plants can grow ideally from a pH of 5.5 to about 7.0. Above or below these values certain changes start to happen within the chemistry of the solution that makes nutrients less available to the plant. The large importance of adequate - yet not excessive - control of pH values is to maintain an optimum absorption of nutrients for your plants. When we go below a pH of 5.5 certain nutrients like iron become very readily available while nutrients like phosphorous and nitrogen become much less available. This lack of availability has two main causes. The first one is the overall change of chemical species within the solution, with the newly generated species being difficult or impossible to assimilate by the plant while the second one is that species that become extremely available generate a strong antagonic effect against some nutrients. 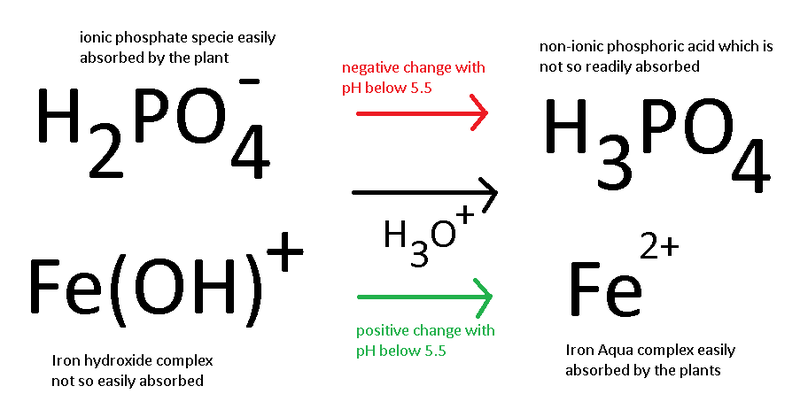 For example, iron is antagonic with phosphorous and with a pH decrease below 5, the absoprtion of iron becomes extremely easy and therefore the aborption of P becomes more difficult, the overall formation of acid phosphate species which are also not so readily available by the plant further reduces P availability. 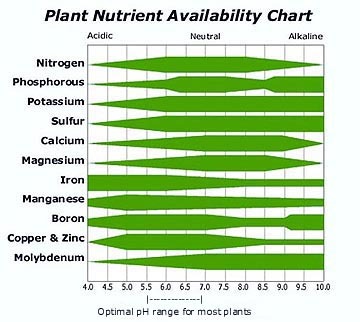 An image shown below gives you a good idea of the availability of nutrients for plant growth as pH changes. However most growers tend to believe that the pH level of their nutrient solution is the pH level that plants have around their roots, something which is actually not correct in the sense that plants have evolved local pH adaptation mechanisms to survive to changes in soil pH. When you measure the pH of your nutrient solution you are measuring the pH of the "bulk" while the pH of the actual root-zone of your plants might be within the ideal zone for nutrient absoprtion. Therefore growers usually underestimate the actual capacity of their plants to correct pH and spend an enormous amount of time tinkering with pH to make it "ideal". The fact here is that plants do not like abrupt pH changes like those that happen when you add pH up/down to continuously adjust your nutrient solution's pH levels. Plants can deal perfectly with a slow pH increase caused by nutrient absorption from 5.5 to 6.5 but when you - in a matter of seconds - revert the pH back from 6.5 to 5.5 in a matter of seconds you are causing your plants significant levels of stress since they are simply not used within their natural environment to such quick pH changes. The easiest way I have found to deal with pH is to simply not obsess with it. Most solutions that are well balanced and contain about 10-15% of the nitrogen as ammonium and about 20-40 ppm of phosphorous will adequately contain pH within the 5.5 to 7 pH region from the beginning of your nutrient cycle to the time when the nutrient solution has to be changed. As a matter of fact - beyond the initial adjustment - the changing of pH can be avoided if the nutrient solution is adequately formulated and given in a quantity of at least one gallon per plant. Plants develop well around these pH levels and the improvement you gain from obsessing about perfect pH zone levels will be lost by the stress you put into your plant roots with pH corrections. Of course, there are easy and almost perfect solutions to pH control like the method using ion exchange resins I mentioned in a previous post. 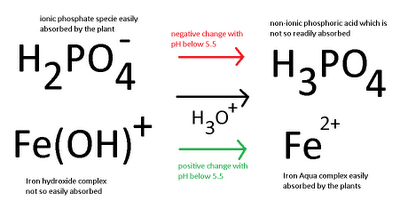 A method that mimics the way in which pH is naturally buffered within soil. Therefore if you want to have a great hydroponic crop with little maintenance and a very good yield I would advice you to prepare your own nutrients taking pH-self balancing and adequate nutrient ratios into account. Certainly this method will give you a lot of control over your composition and a great saving in solution costs. I hope that after reading these two posts on pH in hydroponics you have now grown a much better understanding of how pH is, how it works and how it evolves in a hydroponic culture. It is very important for you to understand that pH plays a vital role in nutrient absorption but that obsessing with strict pH zones is not beneficial for your plants in the sense that constant additions that cause quick changes in pH values cause stress to their root zone. Adequate nutrient design and a good understanding of how nutrient interact is therefore important for the correct use and low maintenance of a hydroponic crop. Why do I have to keep adding pH down during flower? Question. What is the relationship between internal plant ph and solution ph? Are they in a constant state of equilibrium ie does the ph within the plant rise and fall with the ph of the solution? The answer is neither. Internal cell pH is not constant but is indeed maintained within a tight range, cells will need to use additional energy to balance pH when the difference between their internal pH and the external pH is too high. The dynamic ability of cells to correct their internal pH against a gradient is the reason why plants (and many cell types for that matter) can tolerate solutions within a wide range of pH 5-7.5. Cellular processes are specially sensitive to proton gradients (especially respiration), so internal cell pH needs to be properly buffered or maintained by active processes (such as active ionic transport). If I find my solution going from 5.9 to 7.4 in a week, should I aim the next feed/top-up solution to be closer to 7.4 then? Thanks.